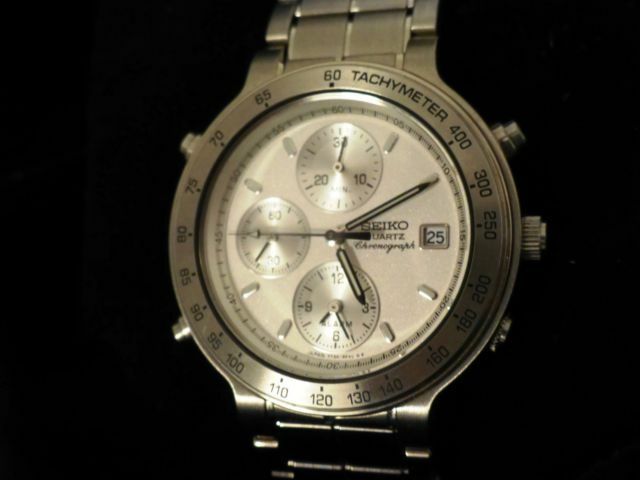 It's a couple of years since I've bought any Seiko 7T32's on eBay, and with the size of my 7A38 collection nowadays, nothing I'd ever consider doing again. As Dirty Harry said: A man's got to know his limitations. I hardly ever wear my couple of 7T32's (nor my 7T59). But it doesn't stop me casually looking. The vast number of diverse 7T32 case model variations produced seems to be endless. 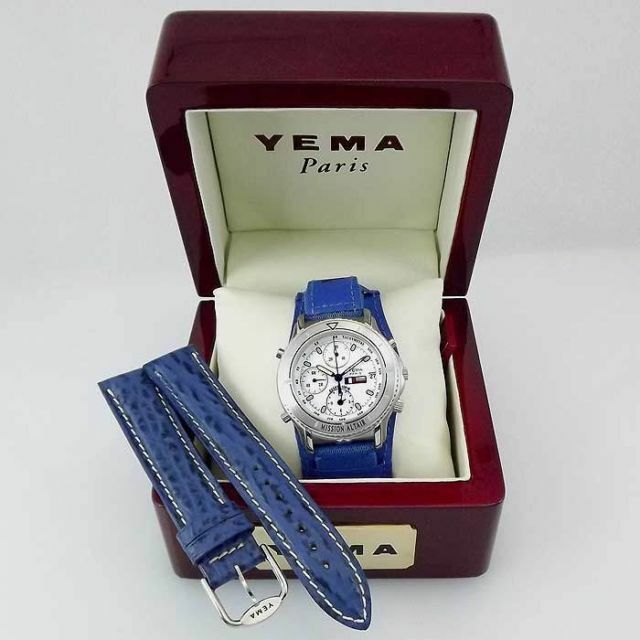 The seller's opening bid price was 99 Euros (approx. £80); there were no takers. Quite attractive though - with very definite shades of 7T59-6Axx about it (or rather should I say 7T52, as there's a Date but no Day). I saw that one as well Paul, and did contemplate it. 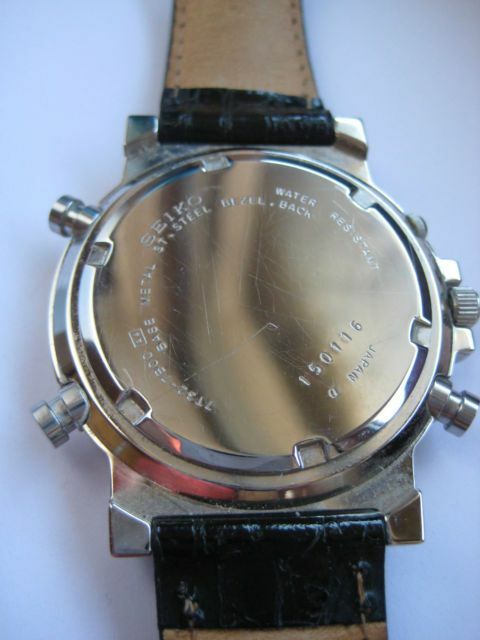 The bezel and pushers are very 7T59. Whereas you and I both thought it was quite attractive (for a 7T32), but not worth the 99 Euros asking price - so did everyone else. The auction ended earlier this evening. Hmm. Or maybe it didn't sell for that price. 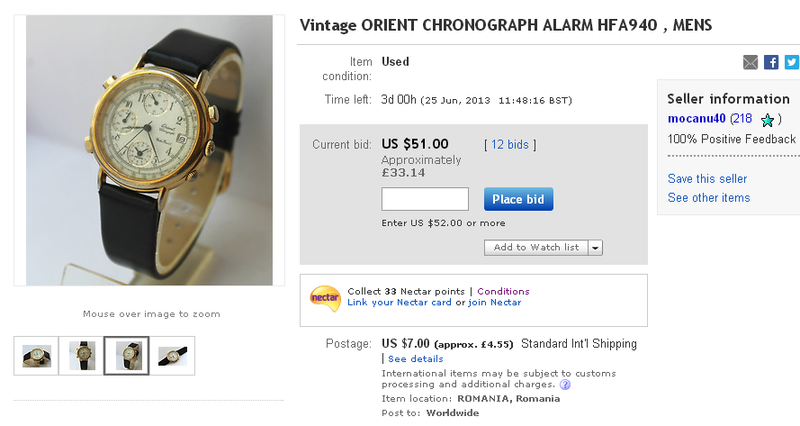 Yet another case of 'Déjà vu', which sadly is becoming all too common on eBay lately. Now this is a white-faced 7T32 (Y182 - same difference / movement) which I could really fancy, because of it's space connection. 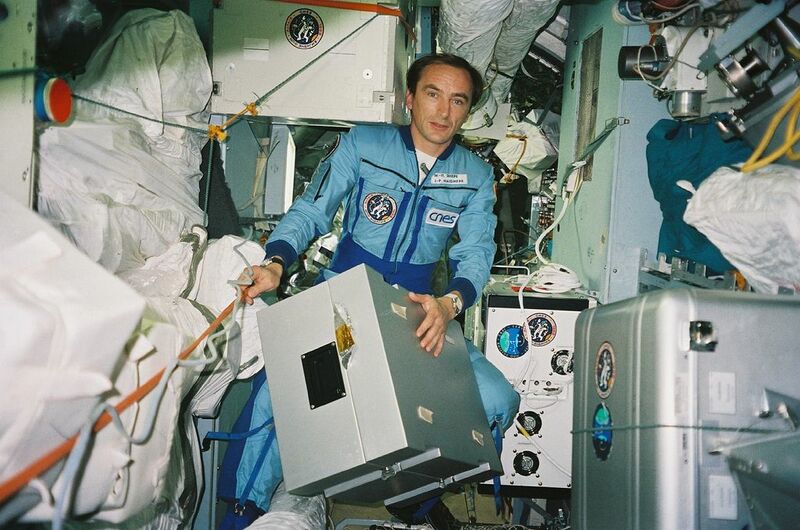 Not a 'Spationaute' by name, but a subsequent model, as worn by Jean-Pierre Haigneré on the Soyuz TM-17 Altair mission in 1993. 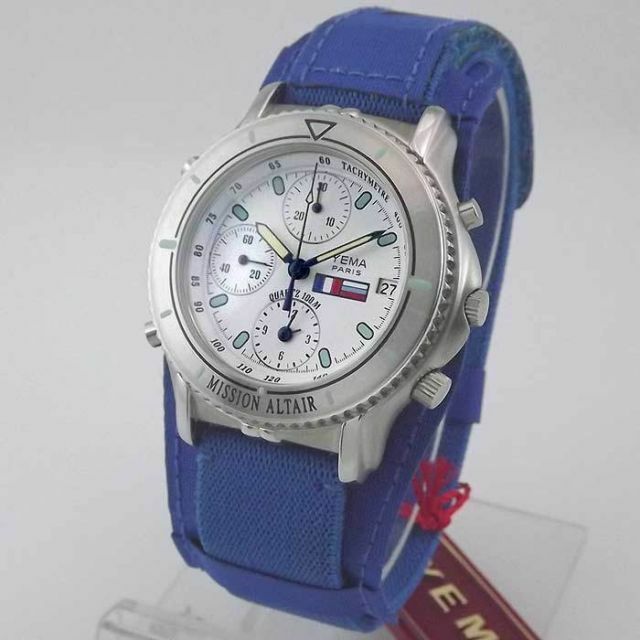 Offered NIB, by the same US eBay seller 'izeldor' (a.k.a WatchFactory.com), comes complete with blue nylon / velcro and shark straps. Pity about the $235 opening bid price though. Just snapped this one up on the bay. Came up on a £30 start or £50 BIN overnight, so I jumped on it this morning. I don't have many blue dial watches, and this is a lesser spotted variant of the 7T32, so it'll make a welcome addition! Photo's to follow on arrival. 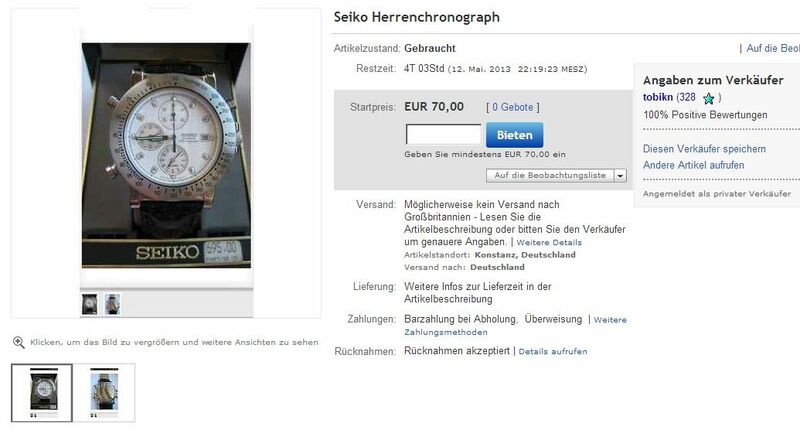 Listed as "Seiko Sport Tuna Chromography" with a distant photo. 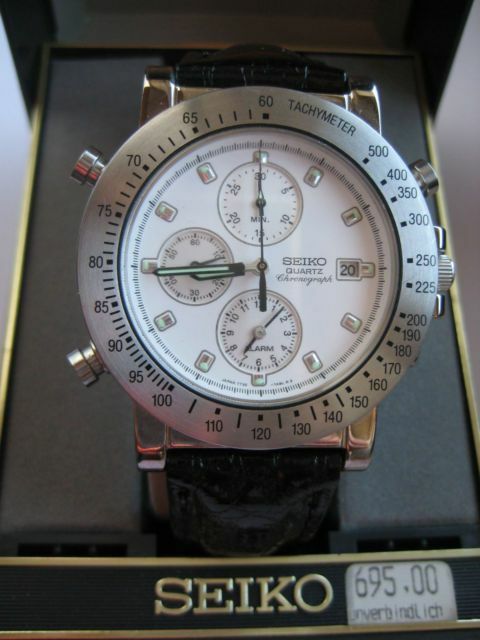 It's actually a Seiko Sportura, and a rare beast indeed. It's the very first branding of the Sportura, and the only variation ever to use to 7T32 movement before switching to the 2 button 7T62. Didn't even break the £50 mark!! Comes with a crazy price tag (probably not too dissimilar to the original R.R.P.) of 695 Euros. So if this isn't a re-listing, I guess it'll be around a while longer yet - rare 7T32 variation or not . Further down the page of my search on eBay Germany I found what appears to be the very same 7T32-7B00 that started this thread. 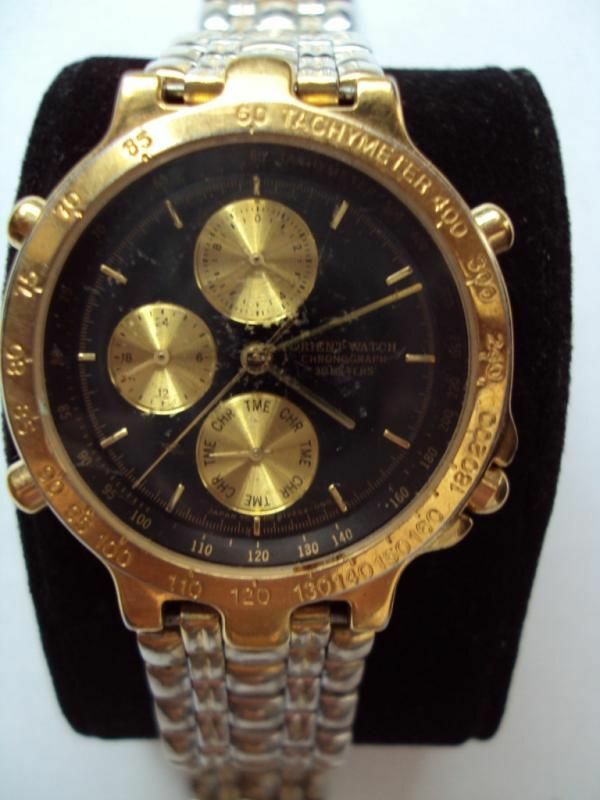 If not the same watch still doing the rounds, the current seller is using exactly the same two photos. 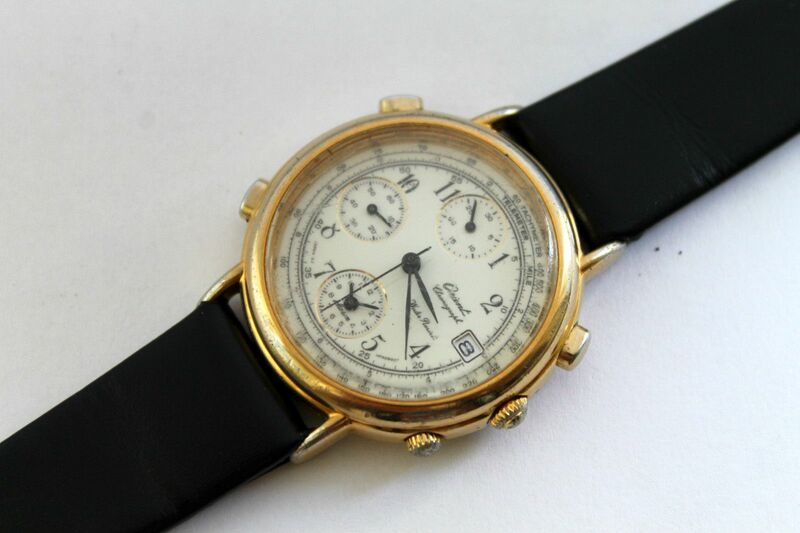 Note, unusually it has dual outer scales: both the normal Tachymeter and Telemeter. Pity about the badly scratched crystal. 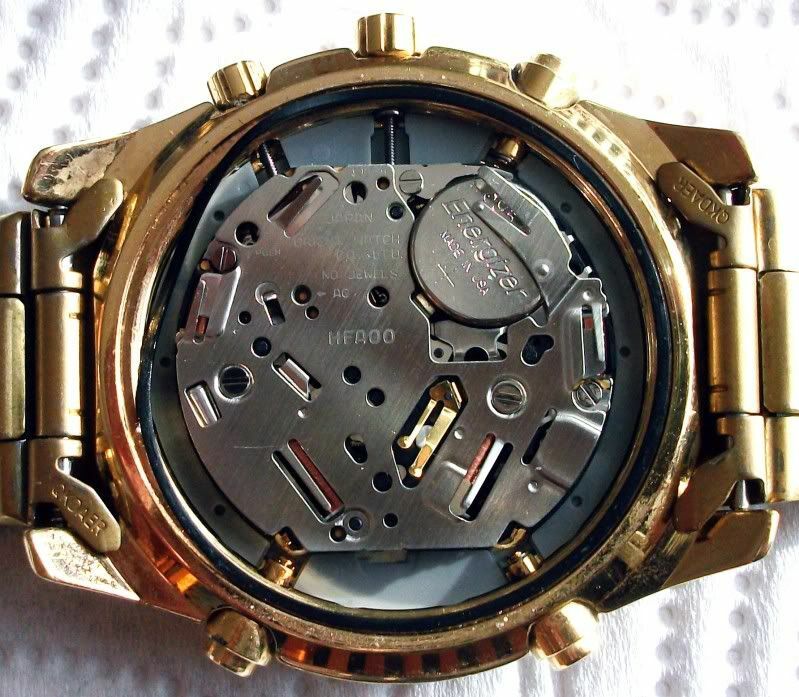 The movement inside will be an Orient branded HFA000, like this - as opposed to a Seiko 7T32B or S.Epson Corp. branded Y182B. 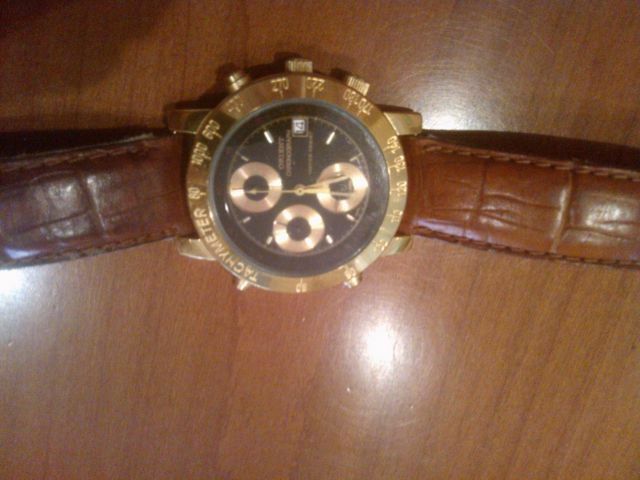 I really like the look of this watch. Yes, I'll admit I'm leaning (even more) towards that 'vintage look' myself lately. Perhaps I'm getting old. 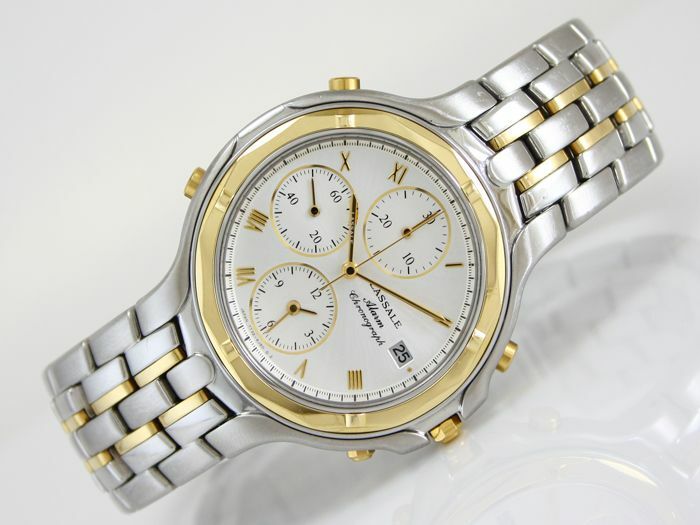 Was sorely tempted by a gold-tone white-faced Roman numeral dial Citizen Cal. 3560 at the end of last year. 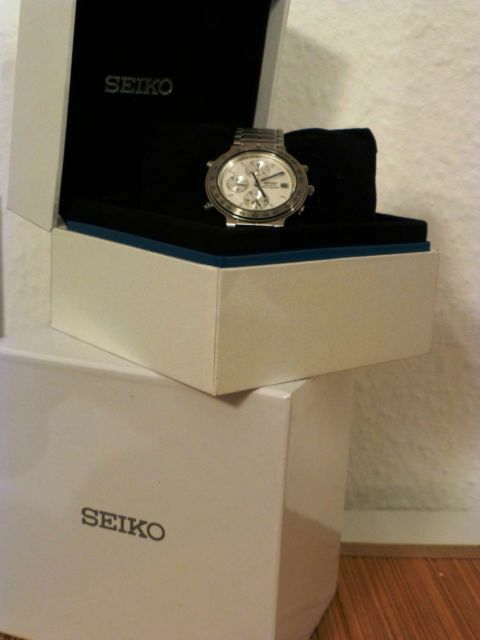 Glad I resisted, because I've managed to secure an example of the Seiko 7A38 equivalent. Of more anon. Be strong Paul- DON'T DO IT!!!!! Look what happened when you thought of getting you first 7AXX model LOL!!!!! Well spotted on that Racer '7T32', Lawrence. You're becoming quite the online obscure watch detective. But I wouldn't say that Seiko were 'protective' of their movements - they seem quite happy to sell them (to every man and his dog). What you'll find in many of these 'lesser known' brands is that the movement backplates certainly won't be stamped 'SEIKO', and probably not even S.Epson Corp. They're more likely to be stamped Morioka Tokei or Shiojiri Ltd, or some other pseudo-subsidiary. 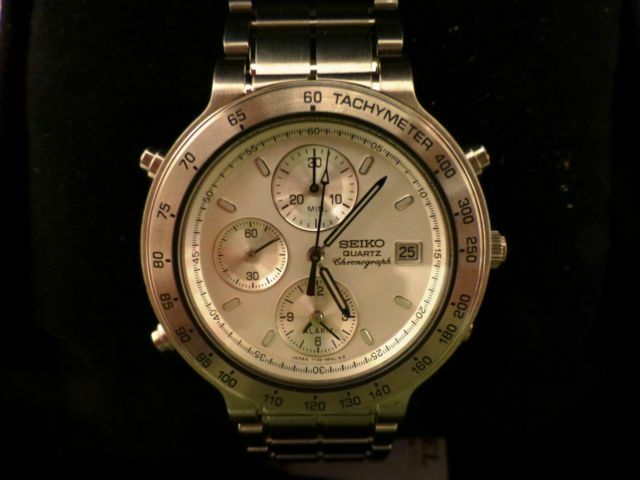 I meant you see Citizen Miyota's in all sorts of nasty Chinese crap but never Seiko designs, even rebranded... Perhaps they're just priced higher so they won't end up in fake Tag Heuers! 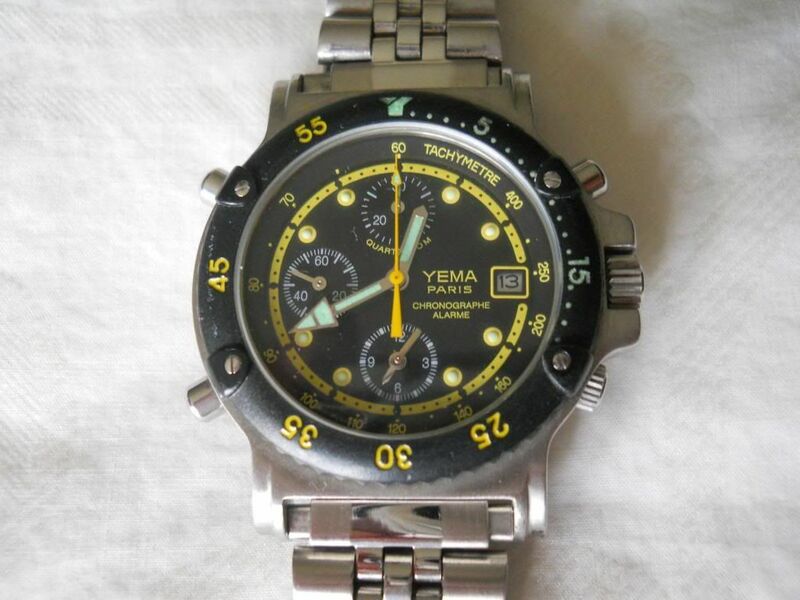 Saw that Yema '7T32' (Y182) myself. I was going to add it on here, but then noticed the nasty after-market bracelet that was fitted. 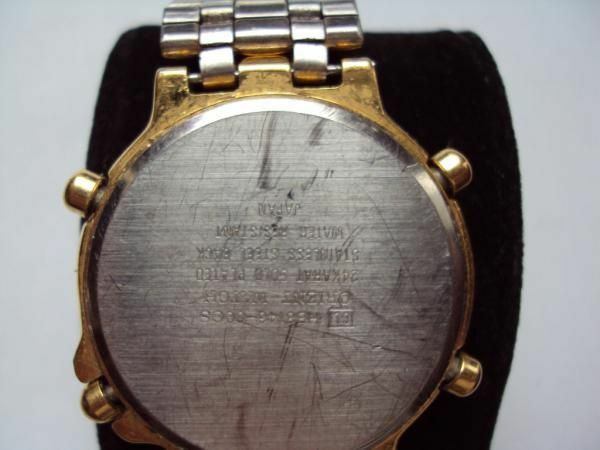 Problem is the case-back is so scratched, it's not possible to read the model number which might give a clue to the Orient caliber. 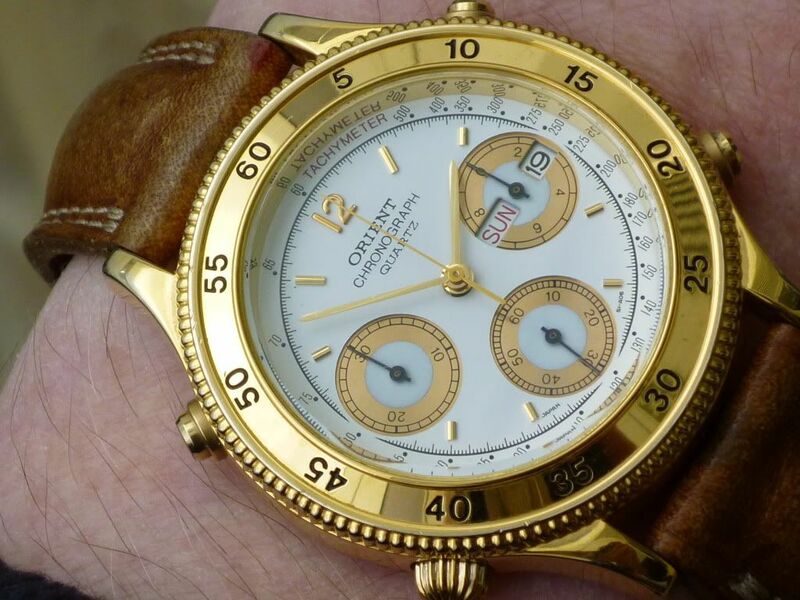 This one is a very blingy Orient 7T32 - a la Rolex Daytona, nearly as bad in taste as my Orient J39909-80.